I have to caveat this post by saying that this sauce is not a true Puttanesca… it has none of the tomatoes, olives, and capers one would expect in a traditional puttanesca sauce, should you place an order for this in a restaurant. 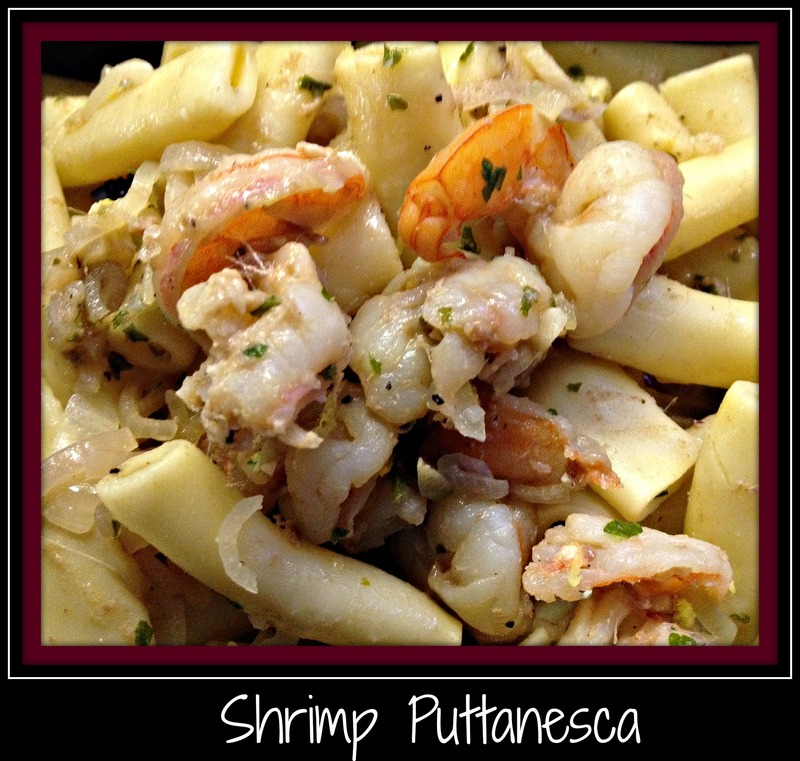 My darling husband isn’t a fan of olives and capers, but I was hungry for something along the same lines of a puttanesca sauce with shrimp, so this is the recipe that came about. I hope you enjoy it as much as we did! I started with a frozen package of Extra Jumbo Shrimp from my local grocery store. I love to pick up packages of shrimp any time they’re on sale, so this is always a “go to” for me… especially since my husband and I both love shrimp. I thawed and shelled the shrimp while they were still partially frozen, so they were easy to peel. I also put a pot of pasta on to cook… cook as much as you’d like for your meal. We like either bowties, rotini, or ziti as any of these hold the sauce nicely and are easy to eat with a fork. If you like spaghetti or linguini, this would be a great recipe to use as well. Once the pasta is almost cooked, I warmed up some olive oil and then sauteed a large amount of finely chopped garlic and shallots until softened and lightly browned. Into the pan, I then added two anchovy fillets (I used the ones packed in oil, because that’s what I had in the cupboard – I’ll use anchovies packed in water for the next rendition) and allowed them to melt into a sauce. SIDE NOTE: Anchovies are fun to cook with because they really do melt into the sauce when exposed to heat and bring a salty back note to any sauce. I find them fun to use, as long as my family isn’t aware that I’m using them… they’re a little finicky about fish in their sauces. Once the base of the sauce was cooked and the anchovies were incorporated, I added the shrimp. As you can see in the photo, I sliced the shrimp length-wise so they would curl up and look pretty in the dish. This also allowed the shrimp to cook pretty quickly and pick up the sauce even better than if they were whole. With the shrimp were in the pan and starting to cook, I added some James River Cellars’ Chardonnay to fill out the sauce. If I were trying to make a meal without wine (why would anyone DO that?? ), I’d simply substitute chicken stock for the wine. I allowed the wine to cook into the shrimp and add a lovely taste to the seafood before topping the entire dish with some chopped parsley. If the sauce is still a little thick, you can add more wine OR you can add a little pasta water. The pasta water will end up thickening the sauce as well, so adding both is not a bad idea either. For plating purposes, I drained the pasta and then tossed it into the shrimp and sauce. This dinner was a huge hit and will definitely be seen often in my “easy/go-to” line up of recipes. Try it yourself and see if you don’t add it to your own family’s favorites! If you’re thinking about making a Valentine’s dinner, this is wonderful for a seafood lover. Just add some crusty bread and a decadent dessert, and your loved one will be putty in your hands. Happy Valentine’s Day! This entry was posted in Cooking, Recipe, Wine and tagged easy recipe, James River Cellars Chardonnay, pasta, puttanesca, shrimp.